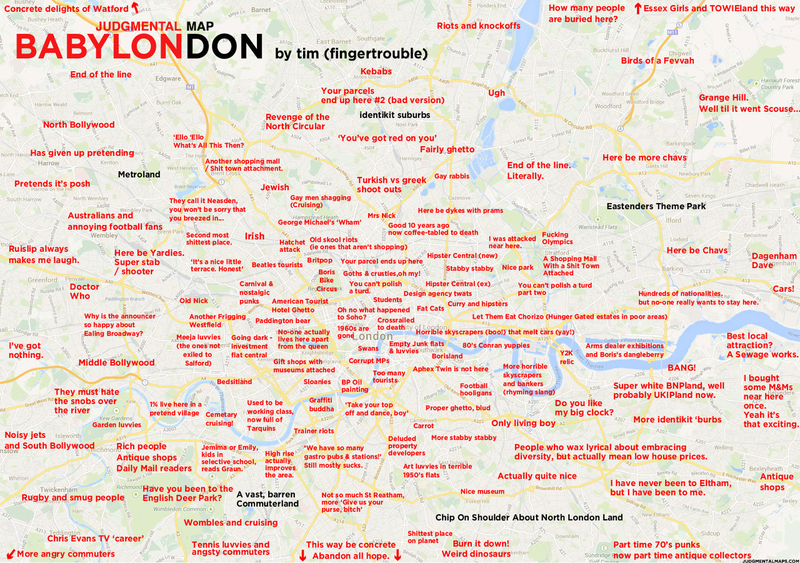 Compared to fantasy maps, maps of real world cities can be kinda boring. Streets and highways criss-cross the land, and empty spaces are few and far between. 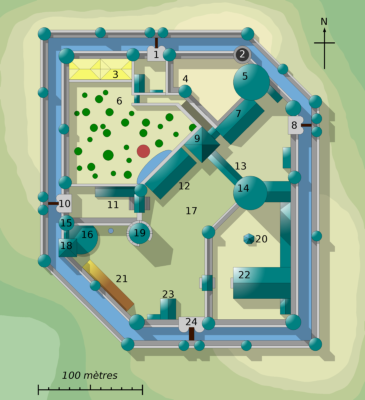 Points of interest are indicated by dots, and parks are represented by bland green rectangles. 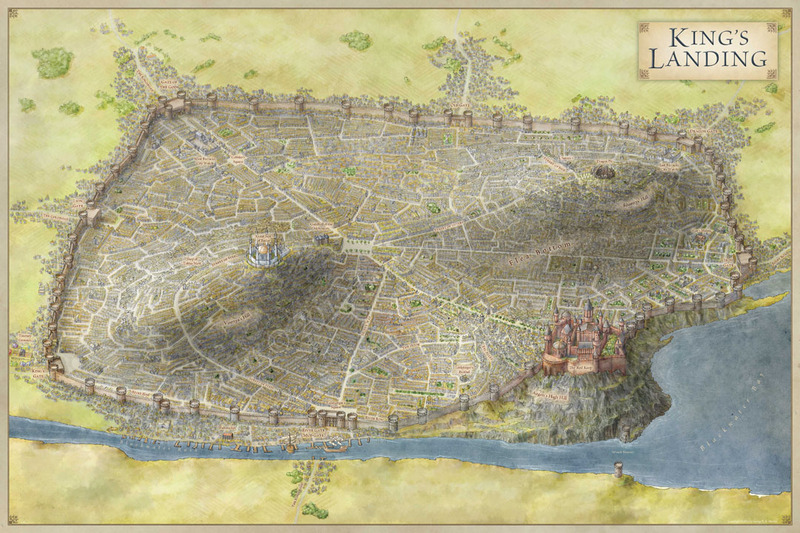 There is not much majesty or wonder in the standard city map, let alone dragons or castles. 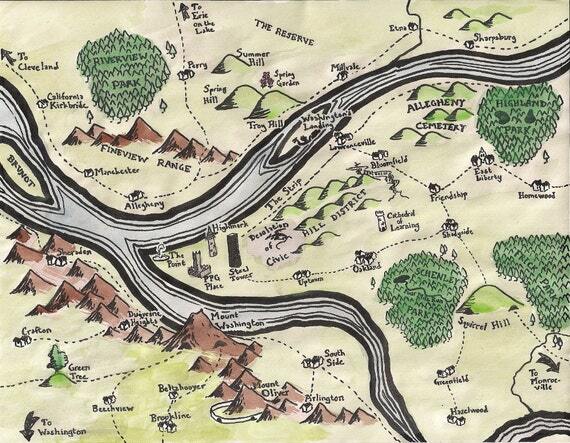 Fortunately for us fantasy map nerds, one cartographer on Etsy set out to change that. 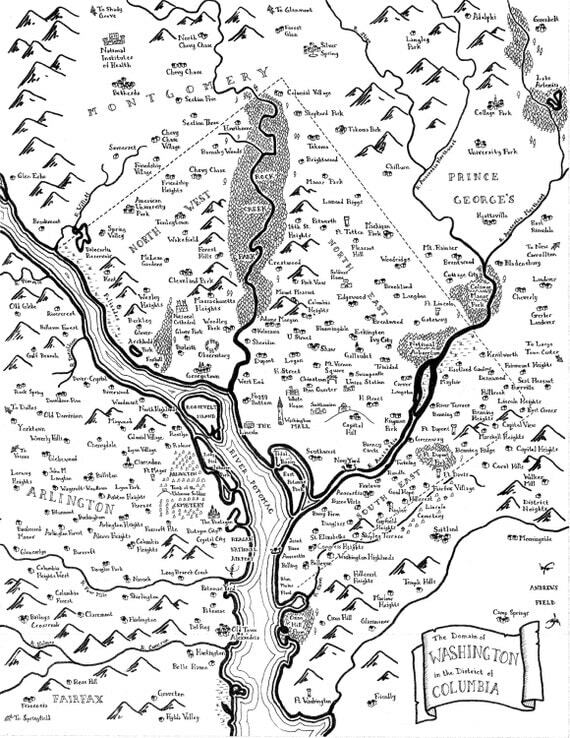 His name is Stentor Danielson, and he sells fantasy maps of American cities along with hand-cut paper street maps and custom order maps on his Etsy store page: Mapsburgh. 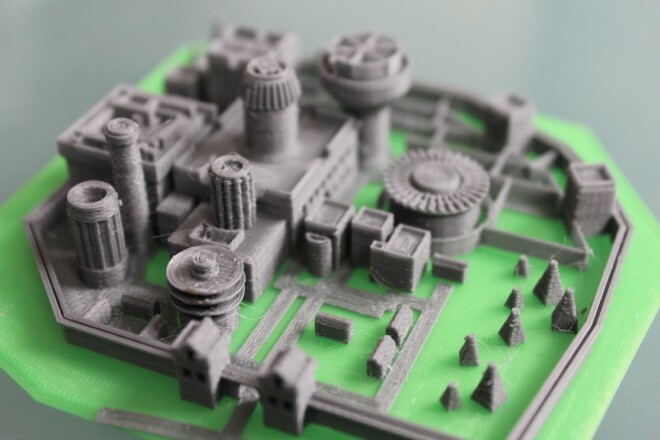 See familiar cities in a whole new light, as they might look if Tolkein had used them for the setting for an epic fantasy journey. Now buildings are represented by towers and castles, parks look like enchanted forests filled with trees, and every mountaintop looks dark and foreboding. 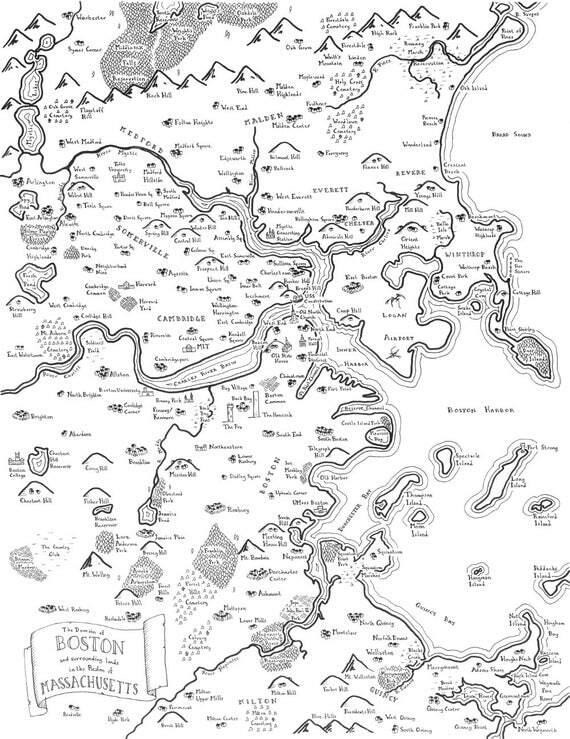 The mystery and sense of adventure that has all but disappeared from cartography in the modern era is back to add some spice to otherwise bland city maps. For more, check out Danielson’s Etsy page: https://www.etsy.com/ca/shop/Mapsburgh. He also has maps of Cleveland and Philadelphia. They sell for between $11 and $26, and for $69 you can order your own custom fantasy map, the perfect gift for any serious cartography nerd. In an earlier post, we looked at the Atlas of Prejudice, which portrays the countries of the world according to the broad stereotypes people have about them. One of the most hilarious examples is how the relatively tiny, compact continent of Europe can be split up in so many ways according to its cultural, culinary, and religious differences. The Atlas of Prejudice tumblr contains many more examples from the book, such as how Americans view other countries, using the most ignorant stereotypes as a way of calling attention to that ignorance for gentle mocking. 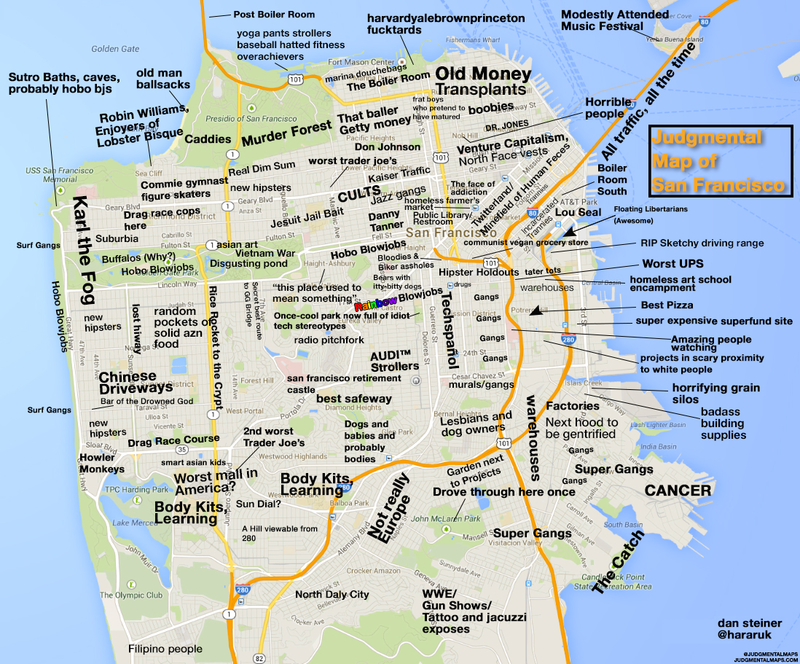 Another tumblr, Judgmental Maps, goes one step deeper and features maps of individual cities. It turns out that even our cities are full of divisions, and positive and negative prejudices abound for the various neighborhoods within them. Once again, try to take these with a grain of salt, as no offense is intended. Viewed on its surface, these maps can bring out the worst in us, solidifying the fears many of us have for unfamiliar places. But these fears are often borne of ignorance, and perhaps, like the Atlas of Prejudice, facing these fears head on will lead us to greater understanding of the world around us. GTA V’s Map: Just How Big is It? 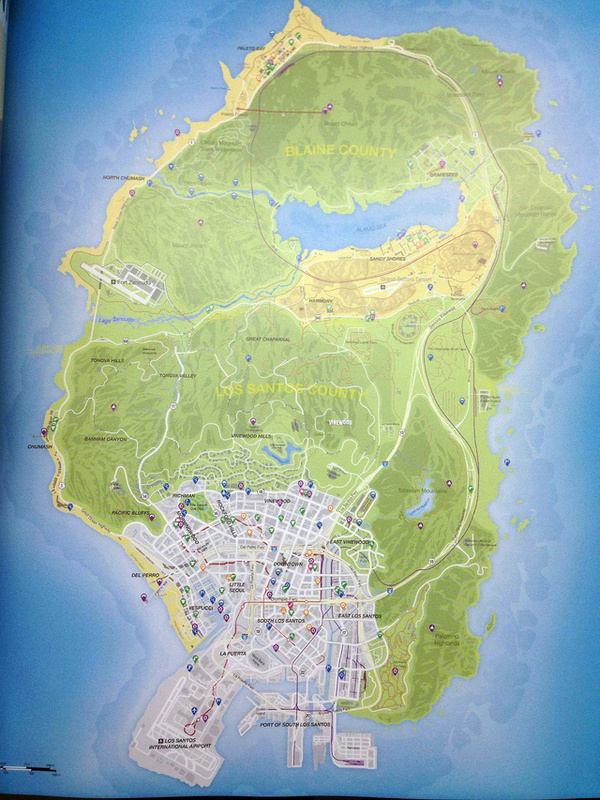 The map for the videogame Grand Theft Auto V has been leaked online, less than a week before the game’s release. By the looks of it, the virtual world of Los Santos is incredibly massive. The sprawling island has a large metropolis in the South, and a diverse surrounding environment filled with mountains, lakes, forests, and beaches. Even if you’re not a fan of the Grand Theft Auto series (which consists of completing criminal missions ranging from stealing cars, to robbing banks, to committing murder and mayhem), or even videogames in general, some respect is due the designers of the game for making such a large, immersive virtual world. The GTA series popularized the genre of “sandbox” games, which give players the freedom to play around in a fully-developed game world, much like a sandbox, without completing the main missions. The player could choose to run around and shoot people on the street, unleashing some pent-up aggression, or just drive around listening to the radio (which, I’m not ashamed to say, I often did with GTA III before I had my license in real life). The game has always been about freedom, and the size of the game world has been like a barometer for the amount of freedom the game allows. With GTA V, Rockstar (the game developer) set out to create the largest world yet, several times larger than GTA IV. 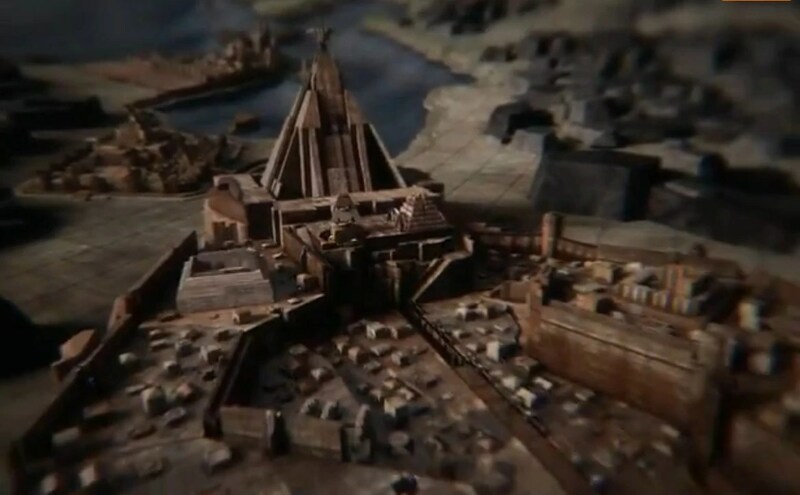 So now that the map has been leaked, does it match the hype? Just how big is it really? Determining scale in virtual worlds provides its own set of challenges. The world seems large, but it really depends on the scale of the map used, not only compared to reality, but in the context of the game mechanics. In other words, what does an inch on the map correspond to in terms of meters or miles, and how long does it take the character to walk or drive that distance in the game? There is a scale in the lower left hand corner of the map above, but I was not able to find a version of the map with high enough resolution so I could read the numbers. 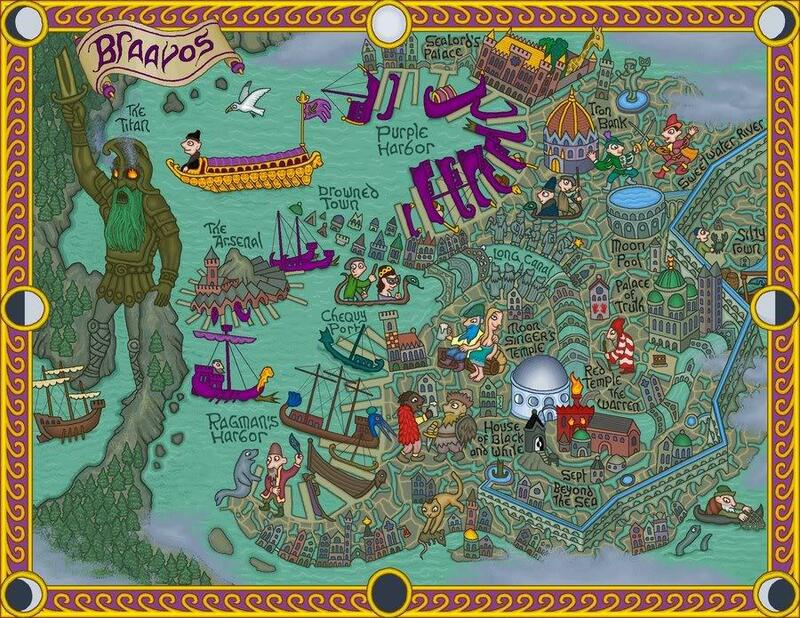 The above map shows scale by using prerelease screenshots of the game, matching them up to locations on the map, and showing how far one has to zoom to attain those views. Seeing people look smaller than ants from above, even when zoomed in, is enough to convince me that this is quite a huge game world. Below is a comparison between GTA V, GTA IV, and real world cities Toronto, Manhattan, San Francisco, and London, which was achieved by scaling the maps so that the sizes of city streets align. 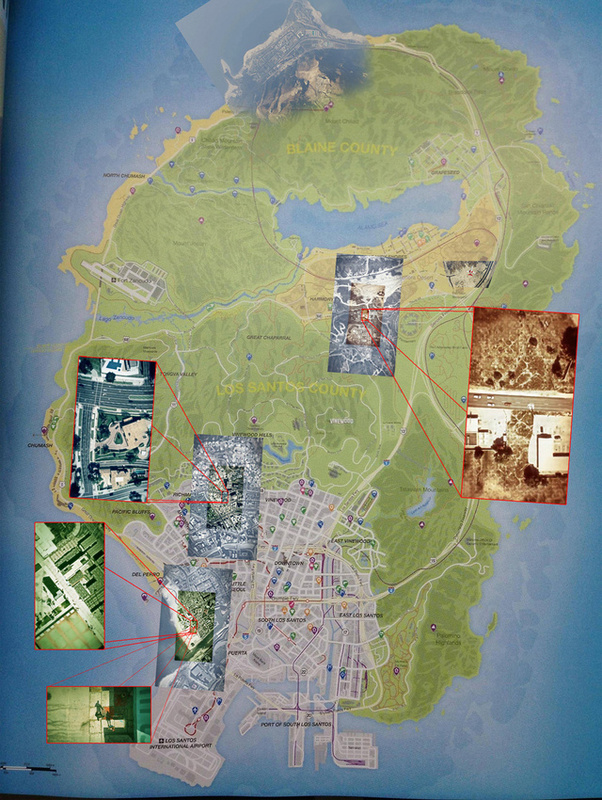 It looks to be comparable in size to all these real world metropolises, but bear in mind that most of the island in GTA V is not urban, and with access to a car, the player would probably be able to get across it much quicker than, say, getting from one end of Manhattan to the other. That should give some idea of the scale of the playable world in GTA V. But players won’t know for sure until they play it, which they can do when it comes out September 17 for PS3 and Xbox 360. GTA players are drawn to the freedom offered by a wide-open sandbox world, so if the scale of this map is anywhere near accurate, I predict GTA V will be another huge hit. 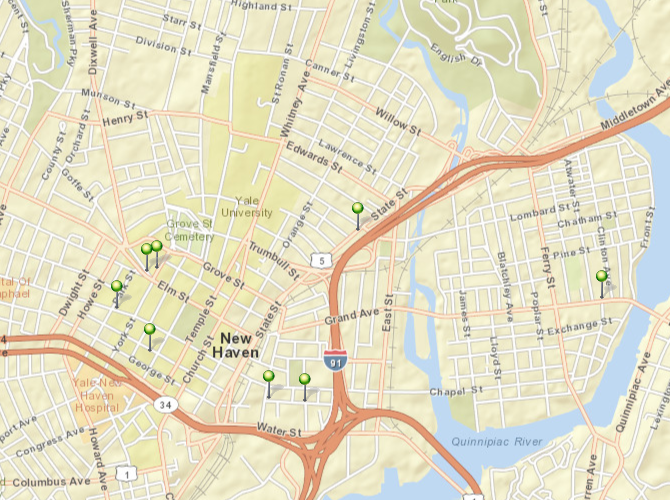 For an online mapping and geospatial technology course, I created a map showing the location of the most popular pizza places in New Haven. I used a website called ArcGIS, which allows you to create and collaborate on interactive maps. It can be accessed at the following link: http://bit.ly/14sqfyS. When you go to the site, you can click on points and it will bring up information about each place. You can also add your own points on the map. If there’s a pizza place I left out, click “edit” at the top, then “stockpoint” or any other symbol on the left side, and then click on a point on the map to add it. You can then add information about the place. Once you add your own places to the map, you can save it and share it at the top, which lets other people visit your map if you give them the link. Pretty cool, huh? As for the map itself, I was inspired to create it since I recently moved to the fine city of New Haven and have been sampling its wonderful pizza options. New Haven style pizza is called “apizza”, and it is baked in a brick oven with a very thin crust. Frank Pepe Pizzeria was the first to use this style in 1925, and many people say that it’s still the best pizza in the city, but lots of newer places compete with them for that title. My personal favorite is Modern Apizza, but I have yet to try many of these places. One interesting thing to note is that most of these places are relatively close to Yale’s campus, further cementing the old cliché of the undying love between a college student and a hot, delicious pizza. 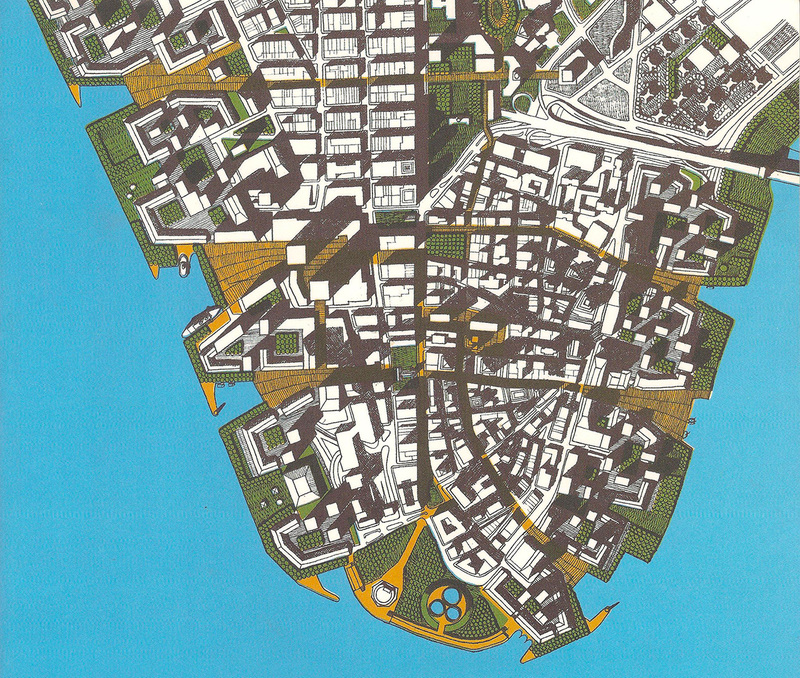 There’s a fascinating collection of unrealized city plans at Wired’s MapLab today. It’s a startling look into what some of the most iconic cities of today, such as New York and Washington, DC, could have looked like, had certain city planners had their way. In some cases, economic and political conditions prevented the change. For example, the expansive and intimidating “Welthauptstadt Germania” plan for Berlin, planned by the Nazis to be ready for the 1950 World’s Fair, never became reality due to the Nazis’ defeat at the end of World War II. 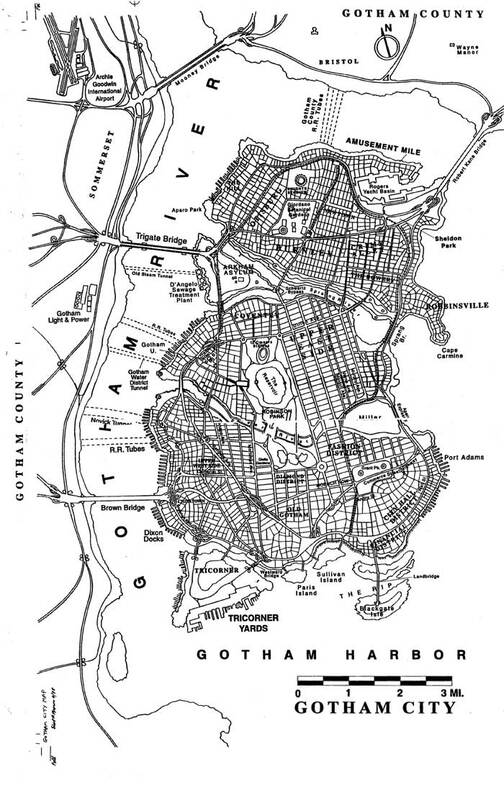 But the 1966 Plan for Lower Manhattan was much more grounded in reality, while still creative and ambitious. It was intended to complement the soon-to-be-built World Trade Center towers, forming the backdrop for a cutting-edge, mixed use neighborhood along the East River. Sadly, when the towers opened in the 1970s, the city was experiencing an economic decline, and the plan was scrapped. 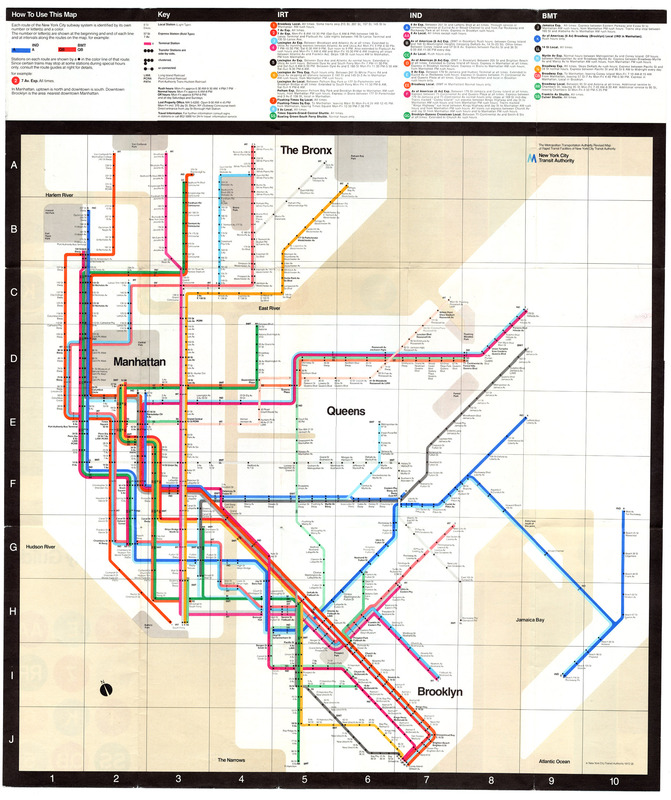 To a non-New Yorker like me, the plan generally resembles the Lower Manhattan of reality. We can see the familiar landmarks of the area, such as the Brooklyn Bridge in the top right, Battery Park at the bottom, and Wall Street as the first main horizontal street from the bottom. 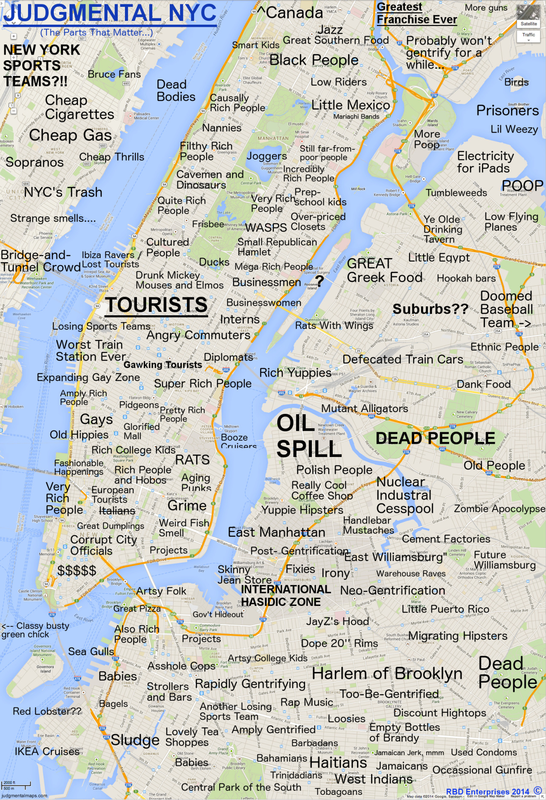 But look closer and there are some key differences, and I’m sure New Yorkers will notice more. In this plan, for example, there is much greater development along the East River, made possible by the addition of landfill. There was also a plan to add underground highways, solving the age-old problem of traffic in the New York City streets. It’s not too far off from the plan, except for the shape of some streets, the lack of landfill developments along the East River, and, of course, the tragic loss of the World Trade Center towers. One also notices the lack of green compared to the city map in the plan, and I hope that city planners keep in mind the need for parks and public spaces when considering ways to improve this mostly-concrete jungle in the future.